The Liberia Investing for Business Expansion Program (IBEX) has received the 2014 Golden Image Award for its efforts to provide technical assistance and empower local businesses. The Golden Image Award is a national Liberian award given to individuals or organizations that have made selfless contributions to peace and humanity, nationally or internationally. The IBEX program, which is funded by USAID, was selected in the international category from among four other organizations and after a thorough vetting process, according to the organizers, Liberia Crusaders for Peace. Deputy Internal Affairs Minister Ranney B. Jackson presented the award and lauded the IBEX program for the significant progress it has made towards promoting Liberian entrepreneurship. He also hailed the program’s continued support to Liberian businesses and efforts to improve the national economy. IBEX provides financial services to micro-, small-, and medium-sized enterprises across seven sectors in Liberia; including agribusiness, clean energy, hospitality, and logistics and transportation. IBEX provides training to Liberian banks, non-bank financial institutions, and enterprises in areas such as access to finance, basic record keeping, social impact investing, and credit risk management. IBEX Chief of Party, Mrs. Watchen Harris Bruce, accepted the award, which included a trophy, a medal and a certificate. Thanking the organizers for the honor and recognition, she accepted the award on behalf of USAID Liberia, Volunteers for Economic Growth Alliance, the International Executive Service Corps, and the entire IBEX team. 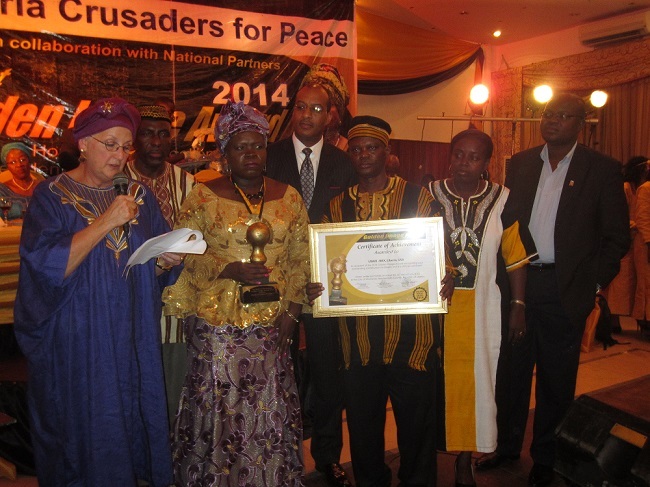 United States Ambassador to Liberia Deborah Malac also spoke at the award ceremony. She listed IBEX’s many accomplishments since its inception in 2012. To date, IBEX has worked with 728 potential clients and has provided loan advisory and loan facilitation services to 572 micro-, small-, and medium-sized enterprises. In addition, IBEX supported the development of 31 loan applications, resulting in $1.22 million in loans to local businesses by local partner banks, International Bank and Ecobank Liberia. Ambassador Malac commended the 2014 Golden Image Award organizers for recognizing the many contributions made by the government and people of the United States—through USAID—to rebuild and improve Liberia’s financial sector. Also attending the award ceremony were several senior Liberian government officials, Armed Forces of Liberia Chief of Staff Brigadier General Daniel Ziankahn, Defense Minister J. Brownie Samukai, Jr. and USAID Liberia Mission Director John Mark Winfield. About IBEX: The Liberia IBEX program is funded by the United States Agency for International Development and implemented under the Volunteers for Economic Growth Alliance Leader with Associate Award by the International Executive Service Corps and Opportunities Industrialization Centers International.